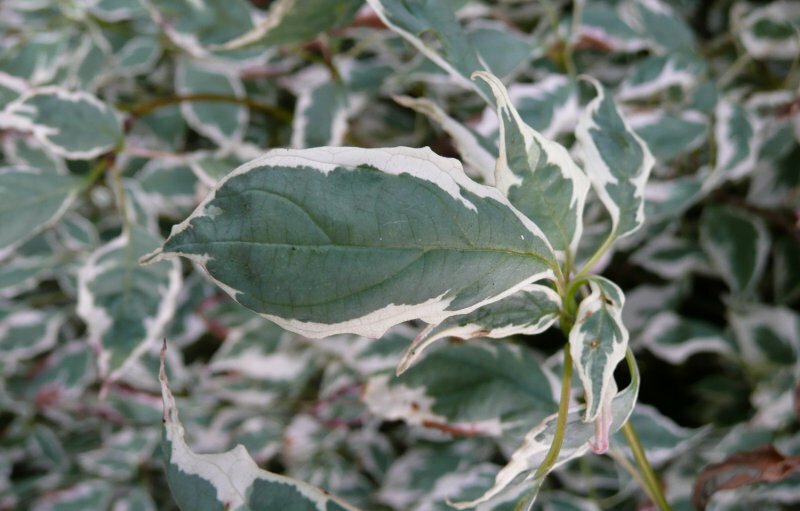 Cornus alternifolia 'Variegata' and Swida alternifolia 'Argentea'. American wedding cake tree, green osier 'Argentea', Pagoda tree and silver pagoda dogwood. Deciduous, perennial shrub or tree. Moderate, reaches full height in around 10 years. Tiers of branches in a broadly columnar shape. Spring to autumn for the foliage, flowers in early summer and berries in the autumn. Happy on most soils, but won’t do as well on chalk. Can be planted in any aspect, including exposed sites. 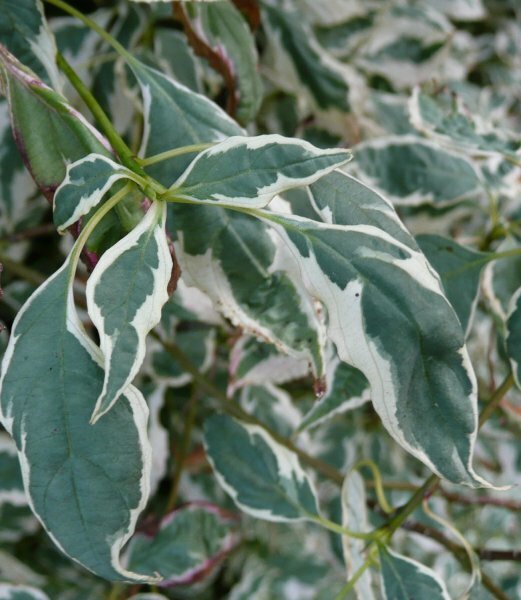 Tiered branches bearing pretty, green/white variegated leaves, tinged pink in cold weather. The white edged leaves and white flowers (borne on small, flat, heads) give this plant an overall silvery-white appearance. The fruits are small black berries. Great for cottage-style and other informal planting schemes. Looks good in borders and can help highlight darker plants grown in front of it. 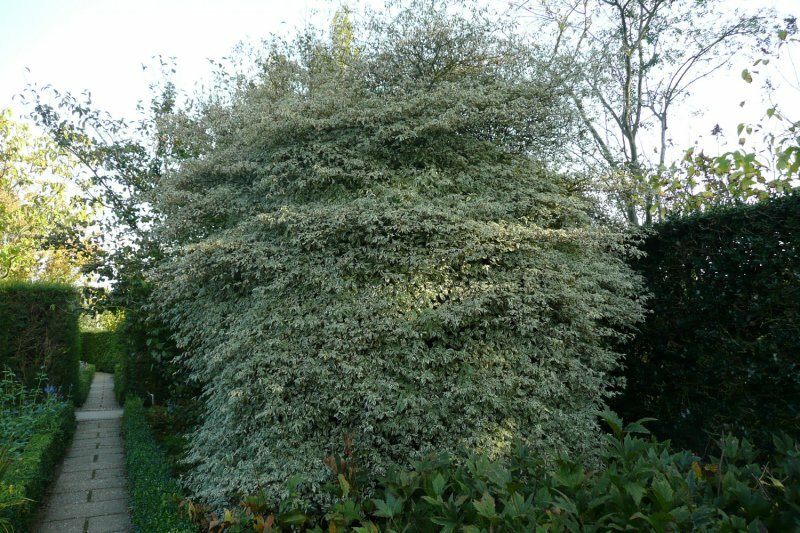 Can be pruned from autumn to early spring. Little pruning is required, except to remove any dead, damaged or diseased growth. However, if you wish to you can train this as a standard (ie so that it has a clear trunk). This can be done by gradually clearing the trunk of side stems up to a height of 1 to 1.5m. This should be done over a period of 2 to 3 years. In this period, any competing leaders should also be removed, so just a single, strong leader remains. The simpler method, albeit that you get slower results, is to take softwood cuttings in late spring to early summer. For the more adventurous, it can be grafted onto Cornus florida or Cornus kousa rootstock with a whip or spliced side veneer graft in late winter. Generally this plant is problem free. The cultivar name ‘Argentea’ refers to the silvery-white colour of the plant.